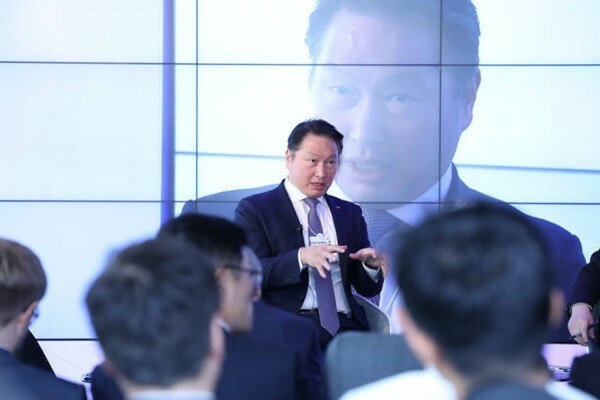 At WEF (World Economic Forum), Chairman Choi Tae-won of SK Group talked about a successful example based on social values and an actual company as a methodology for continuous growth. Chairman Choi held a session under a topic called ‘New Approach towards Enterprise Value’ with Boston Consulting Group at Davos Hotel and discussed about a company’s roles for continuous growth. This is the first time for SK Group to hold a session at Davos Forum. At Davos 2013, Chairman Choi was invited as part of a panel for ‘Impact Investment’ session and presented a methodology for pursuing social values. “We have made various attempts after introducing a concept of pursuing social values.” said Chairman Choi while mentioning various examples such as measurement of social values, application of DBL (Double Bottom Line), and application of Social Progress Credit (SPC). “We are maximizing social values by applying social values to financial statements and having them as key performance indicators.” said Chairman Choi. Chairman Choi mentioned several examples such as SK Energy opening its gas stations as public infrastructures and SK Telecom providing roaming service that allows consumers to use good sound quality for free. Besides Chairman Choi, major SK Group personnel such as Vice-Chairman Choi Jae-won of SK, President Kim Joon of SK Innovation, and President Cho Jung-woo of SK Biopharmaceuticals were also in attendance at Davos Forum.